My interest in the Tennessee Walking Horse and field trialing led me to the National Tennessee Walking Horse Celebration. My horse trainer friend, Earl and I made the seven-hour trip to Shelbyville, TN. We joined another trainer and started going from barn to barn to look at horses for sale. I had no interest in buying but the trainers were shopping for clients. This was a great equine education for me. We then went to a horse auction. Earl told me I should really consider buying one as there were some quality horses going cheap. He pointed out a nice stallion. My response: I am not buying a horse this week, I don’t want a show horse, and I certainly do not want a stallion. 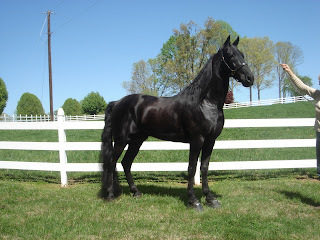 While he was outside talking to a client, a jet-black performance horse strolled in the arena. He immediately caught my eye. His conformation and graceful movement was a sight to behold. It only took 3 seconds, and one quick look at his breeding to start bidding. The energy in the auction had risen, and I lost my mind for the looks and movement of a fine stallion performance horse. When Earl came back in, I said, “Earl, I am about to buy this horse.” He took one look and shook his head with a hardy yes. The lady refused to sell for the bid price and we struck a deal in the parking lot. Later, Earl also purchased a horse for his client. This was completely out of character for me. What just happened? When I called my wife to give her the “good” news, she did not believe me. Especially when I told her the details of my selection. Her shocked response was, “You are never going to Tennessee with Earl again”. Ok, great, I can blame Earl. Actually, honesty is the best policy; I just told her I lost my mind. I guess I could have told her better a horse than another woman but I am positive that would not have helped. Since I did not bring a trailer, I hired a wrangler to take him to a barn for boarding. Earl and I drove back to Statesville that night arriving at 2AM, hooked up the trailer and drove back to Shelbyville early the same morning and came back the same day. Just to recap, I had repeatedly told Earl the three things I would not do in buying a horse. With only visual stimulus, the neurotransmitters in my brain changed so dramatically that I lost my mind in that moment and went against everything I had said. This was a compensatory brain chemistry melee of the first order. If I could bottle that brain chemistry, I could either rule the world or completely destroy it. Well, maybe not as I did not control myself. I weathered the fallout of my purchase decision with my wife, and I still have no buyer’s remorse. It was actually a fine selection of a great horse that has performed and produced excellent offspring. I am not sure what the remedy is for this but I do know that I should stay away from the horse auction.